He looks regal in his stately robes and flowing beard, but when Sint Nicolaas comes to Zeeland next week, he won't be perched on a throne with surrounding servants ready to do his bidding. Instead, Sinterklaas - as he is also known - will be eager to sit in a chair by an old stove, surrounded by a court of smiling children. The kindly bishop, who is the Santa Claus-like figure to children of the Netherlands, has added the Zeeland Dekker Huis & Historical Museum to his list of holiday stops. Sinterklaas will greet young visitors on Saturday, Dec. 3, from 10 a.m. to 12 noon. Adults accompanying the children are welcome to bring cameras so the Christmas moment is captured permanently. The Dec. 6 birthday of Sint Nicolaas has been celebrated in the Netherlands for centuries. He was a Greek Bishop of Myra in present-day Turkey known for his many miracles and habit of secret gift-giving in the fourth century, according to Wikipedia. Due to the fact that some of his relics were transported to a city that became part of the domain of Spain, Wikipedia noted that Sinterklaas is also known to be from that European nation. Presents, especially those given to children, are an important part of the festivities honoring the saint. 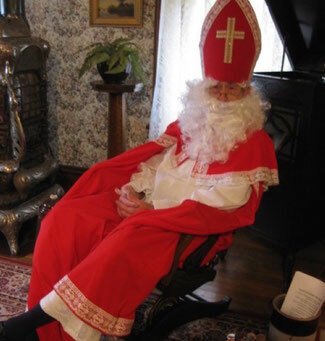 When Sinterklaas comes to Zeeland next week, he will be dressed in full pontifical attire of long, flowing red robes as he sits in the museum's Victorian parlor and tells stories to youngsters. Each child may have a personal meeting with the beloved Christmas figure, eat snacks and create holiday crafts during their stay. The public is invited to explore museum exhibits and enjoy refreshments from 10 a.m. to 2 p.m. on Dec. 3. Admission is free, but donations are welcome. The museum is located in downtown Zeeland at 37 E. Main Ave. between State and Elm streets.